The following is a collection of stories and articles about the Victorian Bakery. Molhem Tayara lays Spinack Fatayer, a Syrian baked good, on a baking sheet while Carol Yager, left, brushes the pastries with butter. 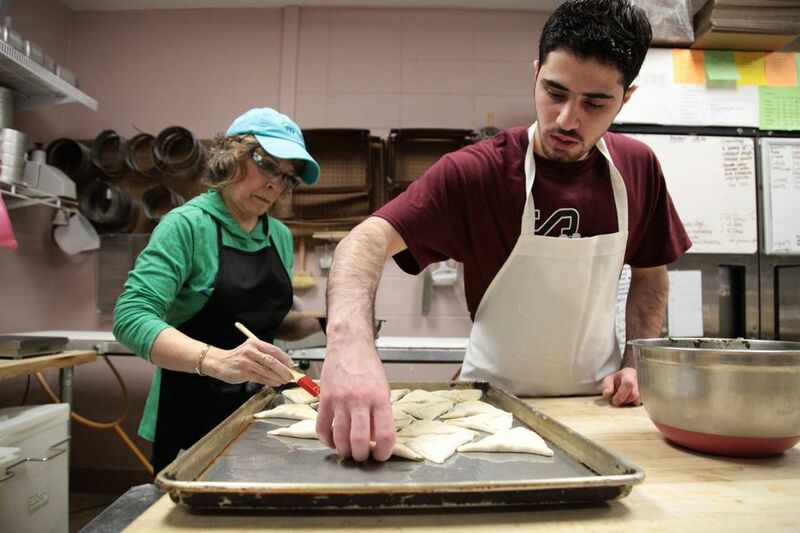 Savory Syrian pastries of thyme, mint, sesame and olive oil aren't easy to find in Kalamazoo. But every Saturday morning since November they've been a draw at Victorian Bakery, where a refugee student sells the treats to help support his parents and four brothers. Maria Brennan operates The Victorian Bakery. Spot someone in Kalamazoo licking their fingers, or a bit of butter cream frosting on a grinning upper lip, and chances are good that they have been to a Kalamazoo bakery. Three popular bakeries are making Kalamazoo a sweet place to be. Molhem Tayara with Maria Brennan. At the Assembly of Extraordinary Bakers, the inaugural event of the Intergalactic Bakers Federation co-founded by bakers and retail business owners Solveig Tofte and Pierre Zimmerman, expert bakers from around the world gathered April 22-23 at Chicago’s Kendall College to share ideas and celebrate a bit of camaraderie.